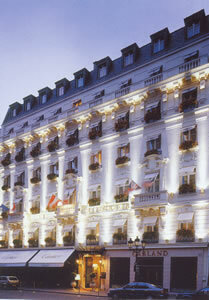 The words from the hymn come to me, from time to time, as I make my way around the grand hotels of Europe. I have never been particularly fond of change. Indeed, one of the societies I founded at Cambridge – the George Corrie Society (named after a 19th Century Master of my own college) – was dedicated entirely to opposing it. My views have changed little over the subsequent decades. Indeed, my experience over the past few years has convinced me that there are too many formerly beautiful hotels which have been wrecked by needless change. What a joy it is, then, to be able to bring before you an hotel in Paris which is elegant, comfortable, well-run, ideally located and (Laus Deo!) thoroughly traditional. I present to you the Hotel Westminster. Of course, there have been developments since the first hotel opened on this site, a few steps from the Place Vendôme, in 1809. The name was changed from the Wagram to the Westminster, when the English Dukes of Westminster began to patronize the establishment. 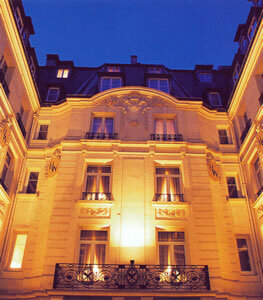 The façade was altered to the designs of the re-builder of Paris, Baron Hausmann. And, very recently, the interior décor has received the attentions of the famous designer, Pierre-Yves Rochon – who, it is important to point out, has shown complete sympathy and respect for the work of his predecessors. (Of how many designers can we say that, nowadays?) After a little shopping – after all, right across the road is Charvet, the shop to which bourgeois Parisian gentlemen of taste always come to buy their shirts – it is thus still possible to walk off the rue de la Paix, stride through two sets of doors and at once be uplifted by the old-fashioned luxury and elegance of the hotel’s entrance hall. I stayed on the third floor in apartment 321, one of the hotel’s 21 suites. 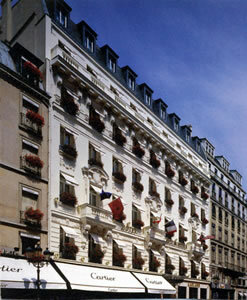 This one was the Suite St-Honoré (1,300 euros a night) and overlooked the very quiet inner courtyard. From the corridor, double doors opened into my sitting room, decorated in the Empire style. Here was gold wallpaper, a crystal chandelier, a marble fireplace, a gilt ormolu clock, an oil painting of flowers and chairs and a sofa in rich tones of red. But do not suppose that the modern appurtenances of life were absent: the air conditioning was silent and effective and the large television resided beside a separate cd player. 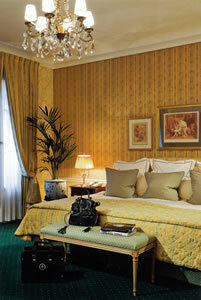 In the bedroom the gold wallpaper – I thought at first it was silk – continued, lit by another crystal chandelier. Here, too, was a second large television screen. Within the fitted wardrobes I found that essential of modern travelling, the private safe. The bathroom possessed a smallish tub, one wash basin and Bulgari toiletries. There was a separate loo. From here I was happy to sally forth onto the streets of Paris, for I can always find something I have not done before in this remarkable city. This time I went to the Musée Carnavalet, in the 3rd arrondissement, to see the ballroom decorated in the 1920s by the Catalan artist José Maria Sert. If you like the idea of elephants, camels and acrobats, cavorting on a silvered background, you should make an effort to see this. It is, to use an appropriately vulgar expression, a hoot. My aesthetic sensibilities thus stimulated, I returned to the Westminster to prepare for dinner. But I found, on reaching the hotel, that all the walking had caused one of my brogues to start rubbing my heel. What to do? Have a word with one of the charming young ladies at the Reception desk, of course. She immediately produced the plasters I needed. That is the sort of service I like. And Le Céladon is the sort of restaurant I like. 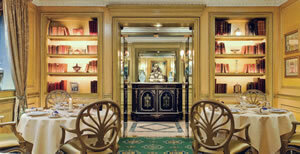 From the picture you will see that it is decorated in the style of the French Regency, with some Oriental touches. (‘Céladon’ is the name of a particular sort of green China porcelain.) 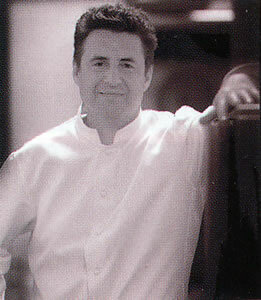 Chef Christophe Moissand (pictured) has a Michelin star, so I was looking forward to my meal. 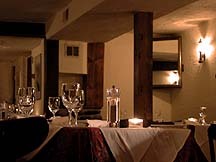 My visit was, however, at the weekend – when the same small dining rooms becomes the less formal Le Petit Céladon, with a simpler menu (with 3 courses and half a bottle of wine for 55 euros) and a much reduced selection of wines. I wondered whether I might be disappointed. I was not, for I was looked after very well indeed by the Manager of Le Petit Céladon, Franck Barthonnet. Panelling, discreet lighting and staff in black made for a restful environment in which to appreciate four carefully prepare dishes. Fried goat’s cheese in bread crumbs, with a salad of walnuts, was straightforward and tasty. Ravioli of mushrooms, perfumed with bacon, was luscious in both its textures and its flavours. Then came the highlight of the meal: quail, stuffed with mushrooms and foie gras and served with a fricassee of white beans. This was a splendidly conceived and executed dish, with tender meat of the very highest quality. After this, the concluding caramel éclair, while good, seemed a bit too minimal. On the main list are about 450 offerings, ranging in price from 22ε for a white Bordeaux to 4,000ε for the 1997 Romanée-Conti. Other bottles to catch my eye were: 1988 Latour (900ε), 1996 Haut Brion (700ε), 1988 Krug (350ε) and 1989 Cos d’Estournel (300ε). 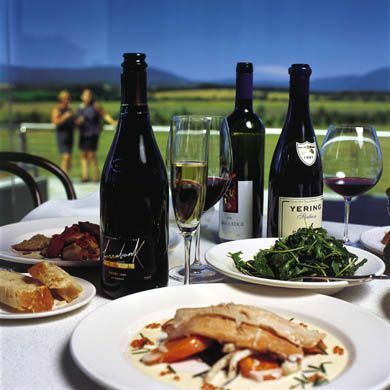 From the short weekend selection, I had poured into the Spiegelau glasses the yeasty, sharp champagne of Deutz (75ε) and a Médoc which – with its ripe, jammy, forward black fruit – could almost have been a New World cabernet (Ch. Rollan de By, 2003 - 57ε). It was to this same room I returned for breakfast (30ε), although the atmosphere was now quite different, for the damson tablecloths had been replaced by ones of beige and there was bright Vivaldi in the loudspeakers. Bacon and sausages, slices of rare beef, dishes of sliced oranges and plates of fresh pineapple – all these fine comestibles I obtained from the buffet, while the efficient waitresses brought my pots of coffee. It was good to start the day in the old-fashioned way. 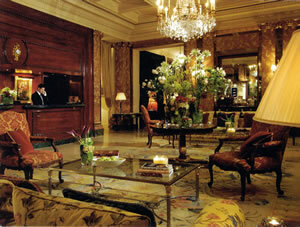 I enjoyed my stay at the Hotel Westminster. Long may it continue to avoid the change and decay which all around I see. O thou who changest not, abide with me.